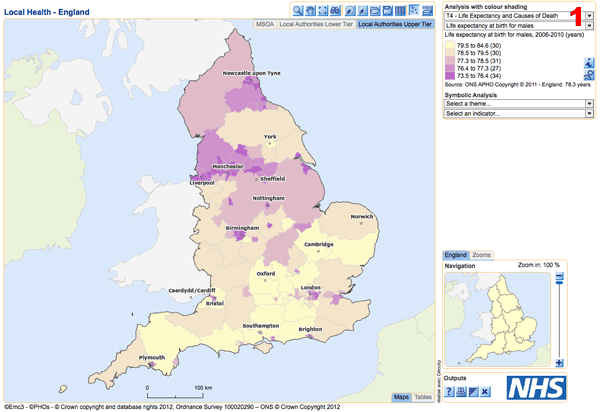 This tutorial about using GIS to investigate health inequalities in England is a guest contribution by Robert Lang. 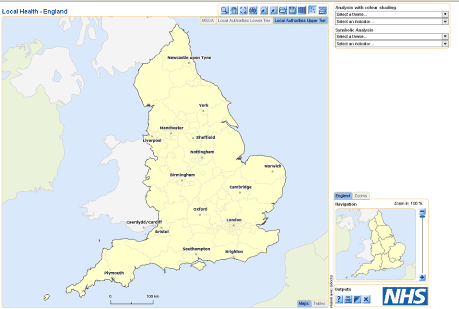 Local Health is an online GIS site of United Kingdom Health Profiles that has been created by Geoclip a French GIS company for the Association of Public Health Observatories (APHO) for the NHS to allow users in health services, local government and the public to access and view health based data. Geoclip has a huge range of topics that they have produced sites for, see their website in the gallery section www.geoclip.fr. 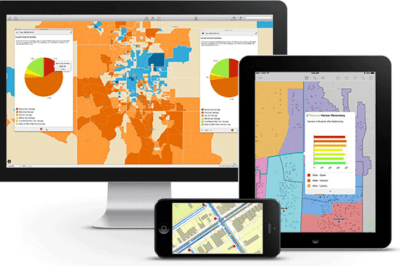 For example there is a USA census one that could be used to look at unemployment and poverty in locations such as Detroit. To use the site you can search by selecting specific indicators or you can search via the map viewer. To access the map click on the Direct access tab at the botttom of the page. A new window will open with a viewer with a map of England. We are now going to investigate health inequalities across England. To do this we will be using the GIS tools of searching by attribute and searching by location. 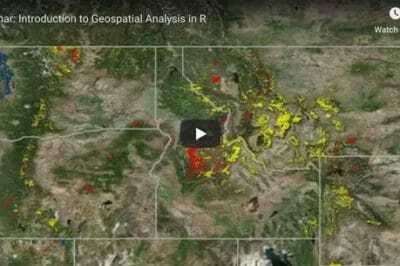 The data we can view can be showed over a range of spatial resolution. Currently the automatic level is set at Local authority upper tier. For the first task we will first select one set of data to view to see how it changes with spatial resolution. First we must select what indicator we want to view. We do this by going to the top right-hand corner of the viewer and click on the Analysing with colour shading tab. 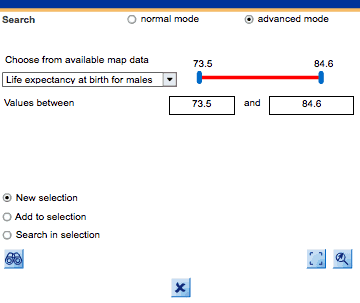 Here we select a theme (1), for this example select T4 Life Expectancy and causes of death, then select an indicator, here select life expectancy at births for males. When you have done this the map will load this information at the LAUT spatial resolution. 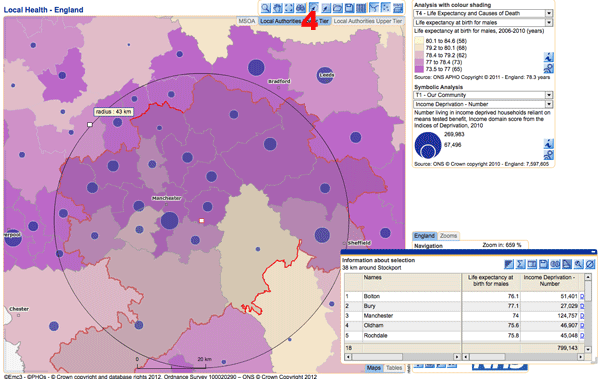 If you now change the spatial resolution of the data available by clicking on the tabs (2) at the top of the viewer to first Local Authority Lower Tier (LALT) then MSOA you will see how the data’s resolution refines and how you can see specific differences across a named area such as Manchester. Manchester area at the Local Authority Lower Tier (LALT) level. Manchester area at the MSOA level. We can now add a second layer of information by adding a proportional symbol layer over the current layer this is achieved by clicking the Symbolic Analysis tool (3) below the shading tool. Here it will give a range of indicators that are available. Not all indicators will be available in this format. For this investigation we will select T1 – our community and then income deprivation – number. Now the map will reload with a proportional symbol. We are now going to investigate which areas around Manchester meet certain requirements. They have to be within 20 km of Manchester and have an average life expectancy under 70 and a deprivation number above 4000. How many areas will meet that criteria? Click on an area you want to investigate by clicking the Selection tool , either by selecting a radius form a given point or by drawing a polygon around your chosen area. This area will become highlighted with a red border on the map and a table will open showing all the areas within the selected area. Here in this example over 300 MSOA appear. Click Life expectancy from birth from the request variable layer and the box will change with a red bar range bar with two boxes below it giving the range of values for this indicator. You can either type in the number you want or move the range on the red bar to your desired values. In this example I have selected 66.5 to 70 then click search in selection then the search button. In the table the places that have under 70 years life expectancy now appear in the box and are highlighted on the map with a red border. I f I then want to search further within the selection for example Find places with under 70 years life expectancy and a deprivation number over 4000 to represent the most deprived area. Repeat the process and then in the drop down menu repeat the process but this time only 3 places met the attribute search. 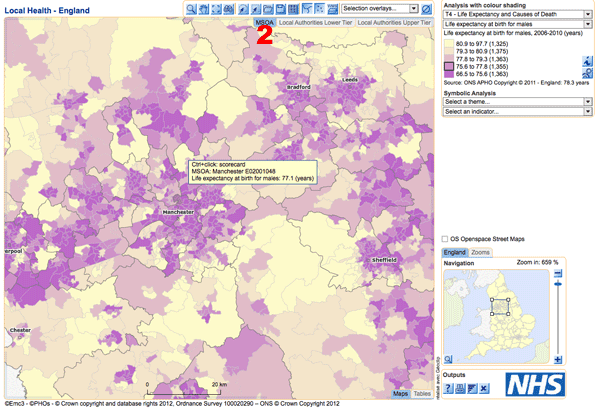 Are these places the most deprived areas in Manchester based on our two selected indicators. By selecting different indicators and combinations of indicators you should be able to investigate some of the inequalities across England. 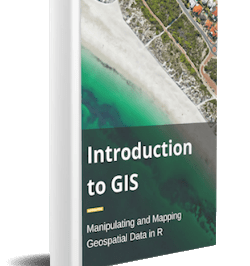 This website geoclip also has a range of viewers for a number of countries such as the USA where you could investigate inequalities based upon ethnicity or rural vs urban areas for example. These examples can be found in the gallery section of the geoclip website www.geoclip.fr.